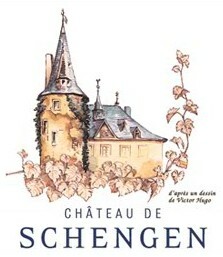 The estate covers 12 ha (over 29.50 acres) of vines, well located in and around Schengen and divided into some 25 different plots. The majority of the vines are spread over the slopes; they are highly demanding in manual labour and are cultivated according to integrated farming methods ("culture raisonnée”), banning pesticides and chemical fertilisers. Only hand harvesting can ensure that the ripest and healthiest grapes are picked at the appropriate time. According to the vintages, the grapes are picked in several batches. The harvest usually begins around September 25th to end in early November with the Riesling grapes. Only the best wines are sold under the label of the Domaine, in total just over 30.000 bottles of still wines and 3.000 bottles of Crémant.